Light micrograph of a section of normal human lymph node. 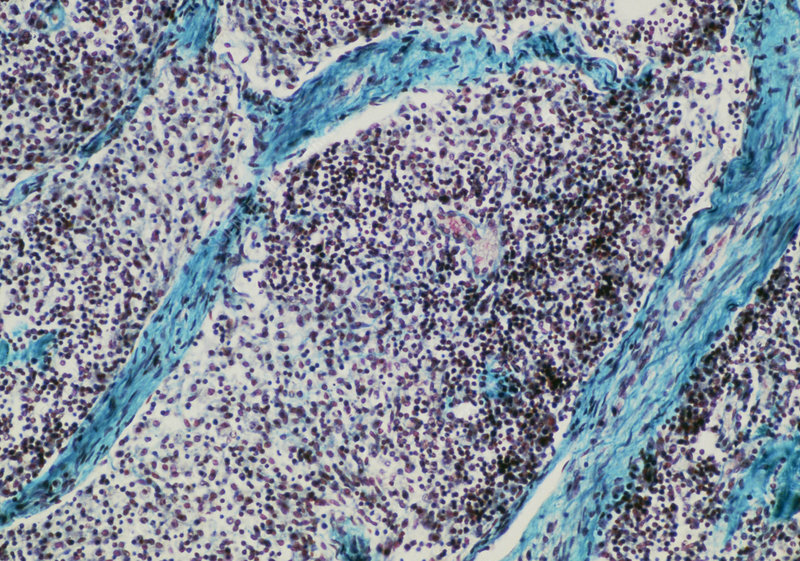 Each lymph node, about the size of a haricot bean, consists of aggregations of lymphatic nodules, seen here separated by connective tissue (blue). Each nodule is a densely packed mass of lymphocytes with nuclei stained purple. The blue-bound region above centre right containing red blood cells, is a blood vessel. The primary function of the lymph nodes is the production of lymphocytes; these may leave the node either via sinuses (white areas), or by passage through the wall of blood vessels. Magnification: x50 at 35mm size.